Overall, BinaryMate scores really well, let’s break it down. They seem to have a good account type based bonus system and this earned them 90/100. Their software catches the eye, but is a bit complicated so we gave it 80/100. Customer support is both useful and unique as the broker provides their customers with live video chat. Broker’s options choice is average in comparison to other players in the field, so gets a 75/100. The financial markets have always been a field where there is high turnover of money and competition is fierce. Not least among the brokers. The industry is also known as a place where scams abound and reliable brokers are scarce. One has to look at a number of factors to determine whether a broker is legit and trustworthy and we are going to do exactly that with BinaryMate, to give you an in-depth review as well as our verdict on the services they provide. BinaryMate was founded in 2016 and currently the broker has their headquarters in Scotland, with registration number 114612 in the Seychelles and it is owned by Lerona Impex SA. 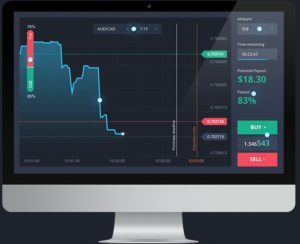 They use a proprietary platform with a few categories of assets and on their website they state that they currently have 3103 accounts in their system, around 4 million dollars worth of trades per month, paying around half a million dollars to their traders and processing withdrawal requests in about 50 minutes. Pretty impressive figures. The broker offers over 100 assets across four different categories. It might look like a drop in the ocean, but if you look through each category, you can see that it is more than enough. The categories covered are: stocks, currencies, commodities and indices. In the area of stocks they have 80 instruments to trade, which is quite a lot in comparison to most binary options brokers, who do not offer individual stocks for trading. Currency category has 30 instruments, which is enough as all most popular pairs and their crosses are there. Commodities contain 9 instruments and that is satisfactory as the list of them isn’t that large in reality with most brokers. Finally, there are 37 instruments in the category of indices, which is quite a lot as most brokers offer around 10-15 of them. The minimum deposit to open an account is $250. The range for a bronze account is $250-999. You will get 25% of your deposit amount, which you will have to trade 20 times before you can cash out the sum. More about terms and conditions of the bonus can be read on their website. You will also get free video chats, withdrawals in 1 hour and a demo account. You will get a silver account if you deposit between $1000-2999. You bonus will be 50% of the deposit amount and you will get everything a bronze account holder gets plus Master class (web session) and first 3 risk free trades, which means if you lose your first 3 trades, the money will be paid back to you. Again, you will have to check terms and conditions for those trades and compensation in case of a loss. As you may understand most privileges are for Gold account holders. The range of deposit for the account is $3000-50000. The bonus for the account is 100% of your deposit amount. You will have to trade it 20 times before you can withdraw the money. Gold account holders will be able to enjoy the same benefits as silver ones, plus Swiss prepaid card and a personal success manager. BinaryMate does not charge any fees or commissions on your trades. The minimum deposit is $250 and the minimum withdrawal amount is $50. We could not find any information regarding the maximum deposit amount allowed on their website, so we assume the Gold account limit of $50000 is the sum. Minimum trade amount is $1 and the maximum is $1500 or Euros. Payouts vary depending on instuments and types of options as well as length of expiry, but the maximum payout is 95%, which is quite large in comparison to what most other brokers offer. The other trading features seem to be industry average and neither impressive, nor upsetting. BinaryMate’s proprietary trading platform is really impressive. 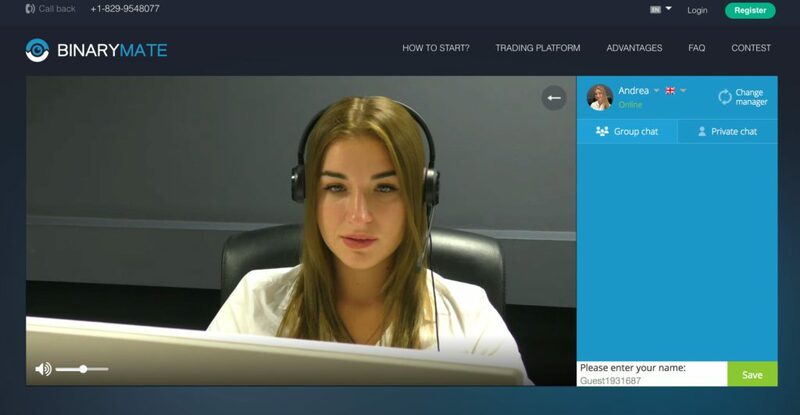 It is a bit complicated, but it also has a built in video chat and you may ask questions and get live answers that will help you to solve your technical trading difficulties on the fly. hey have web, Android and iPhone trading platforms and you may choose whichever you want. You can trade High/Low, 60 seconds and Long Term options on them. It is good that you do not have to download any software and can trade web version straight from your browser as this means you can literally trade form anywhere. We have already pointed out that you can trade binary options on your Android or iPhone device wherever you go, without the need to carry your laptop around with you. The apps are free to download from Apple App Store for iPhone and from Google Play for Android devices. It is good that those contain practically the same functions as web platform. You can deposit and withdraw money, login to your account, check your portfolio, analyze charts and look through your entire trading history. In this aspect, BinaryMate is really a leader in the industry. Funding your account is quite easy and really secure as the broker uses SSL certified 256 bit Secure Processing. Your funds will also be kept securely in a European bank. They have a number of ways for depositing and those include: Visa/Mastercard, Bitcoin, Neteller, Skrill, Perfect Money. They claim that they do not charge any fees for depositing, except Visa and Mastercard. Certain ways of depositing have certain restrictions for certain countries and you can find about that on their ‚Funding methods‘ page. Minimum deposit is $250 and maximum is $50000. They do have a few more methods for withdrawal and those are: Qiwi Wallet (for Eastern Europe) and Ok Pay for all countries. Withdrawal time is really fast. Most methods take up to 1 hour. Of course, there are security measures, so you may see some delays, but that is for the better and for the reduction of risk. Minimum amount for withdrawal is $50 and you will be asked to process identification documents to avoid fraud, money laundering and for security purposes. BinaryMate have developed a unique support team. This comes in a form of video chat where beautiful ladies (account managers) respond to your queries and do their best to provide you with all the necessary answers. This live chat is available 24/7 for registered members and it can be accessed both on their website and your trading platform. You can also get replies by email; phone and you can also get a call back if you request one. They will also provide you with account managers for one to one training, lessons and for videos. The broker may not boast about extra educational features and resources, but they have weekly trading contests where you can get a share of $20000. The sum is proportionally distributed among top 20 traders. When you open and fund your account you can participate for free in these contests. Be sure to read the rules, terms and conditions for participating and winning attractive money prizes. Despite the fact, the broker lacks some trading features on their platform and could improve on the ways of deposits and withdrawals they do seem like a reliable entity that cares about their clients, safety of their funds and does their best in terms of customer service. In case of negative trading results, risk-free trades are compensated in the form of a trading bonus based on bonus provision rules. In order to access this service, speak to your account manager. Binarymate processes all withdrawal requests within 1 hour. However verification may take longer, if client hasnt submitted all of the necessary documents in time. The minimum bet amount on Binarymate platform is $1 (or €), and the maximum – $1500 (or €).